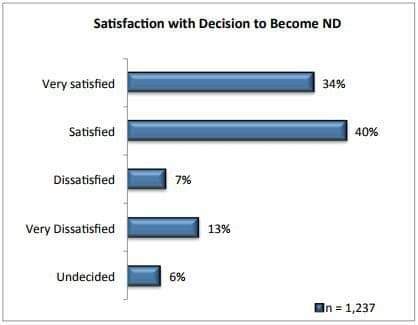 Can I Achieve Career Satisfaction as an ND? Forty-nine percent of participants practicing or using their degree are satisfied or very satisfied with their income. This is especially true for those practicing full-time, and those using their degree in a nonclinical setting. Naturopathic Doctors who feel successful overall in their career are more likely to be satisfied with their decision to earn an ND degree, their income, their work-life balance, and their financial success. They are also more likely to rate themselves as passionate about the work that they do. Whether practicing full-time as an ND, part-time as an ND, or in a non-clinical capacity, there are endless options to explore after graduating with an ND degree. Take the first step towards career satisfaction as well as a dynamic and fulfilling journey in the field of naturopathic medicine, by requesting information to find the school that’s right for you. ** “Survey of Naturopathic Physicians,” AANMC, (Summer 2004).